A nice CDV of Captain John J. Sauvan of the 17th New York Regiment , identified in period ink on the reverse it is made out to another 17th New York officer, Captain Nelson B.
Sauvan was fifty-six years old when he was commissioned in July 1863. Records indicate he was mustered out just one month later. In this carte by Meade Bros. Of New York, Sauvan is seen dressed in a frock coat with epaulettes and a plumed Hardee hat with infantry horn badge. He wears a sash and sword belt with 1851 eagle belt plate. His M1850 foot officers sword his held before him. The carte is in very good condition. The top two corners are slightly clipped and it exhibits minor toning and foxing. It measures about 2 1/2 x 4. 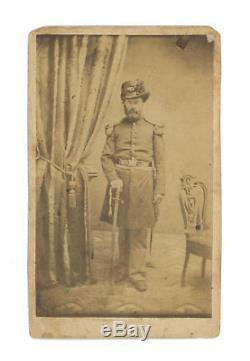 Please see my other items for more Civil War CDVs. 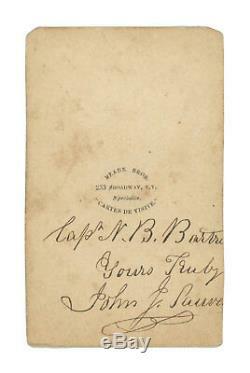 The item "Civil War CDV of Captain John J. Sauvan, 17th New York Plumed Hardee Hat" is in sale since Thursday, January 31, 2019. This item is in the category "Collectibles\Photographic Images\Vintage & Antique (Pre-1940)\CDVs". The seller is "iron-horse-sales" and is located in Champaign, Illinois. This item can be shipped to United States, Canada, United Kingdom, Denmark, Romania, Slovakia, Bulgaria, Czech republic, Finland, Hungary, Latvia, Lithuania, Malta, Estonia, Australia, Greece, Portugal, Cyprus, Slovenia, Japan, China, Sweden, South Korea, Indonesia, Taiwan, South africa, Thailand, Belgium, France, Hong Kong, Ireland, Netherlands, Poland, Spain, Italy, Germany, Austria, Bahamas, Israel, Mexico, New Zealand, Philippines, Singapore, Switzerland, Norway, Saudi arabia, United arab emirates, Qatar, Kuwait, Bahrain, Croatia, Malaysia, Brazil, Chile, Colombia, Costa rica, Dominican republic, Panama, Trinidad and tobago, Guatemala, El salvador, Honduras, Jamaica, Uruguay, Viet nam.